thats my favorit anology to understand it clearer. "The heart is just the heart; thoughts and feelings are just thoughts and feelings. Let things be just as they are! Let form be just form, let sound be just sound, let thought be just thought. Why should we bother to attach to them? If we think and feel in this way, then there is detachment and separateness. Our thoughts and feelings will be on one side and our heart will be on the other. Just like oil and water—they are in the same bottle but they are separate". I painted this in MS paint (mad skills I have) just to make it more visually. Should I put in something more? Buddhism is just like an educational system so why not paint our way to understanding? The heart is just the heart; thoughts and feelings are just thoughts and feelings. Let things be just as they are! Let form be just form, let sound be just sound, let thought be just thought. Why should we bother to attach to them? If we think and feel in this way, then there is detachment and separateness. Our thoughts and feelings will be on one side and our heart will be on the other. Just like oil and water—they are in the same bottle but they are separate. I don't know what you'd call this but it's just off PowerPoint. You could put at the bottom where everything sinks in nivanna or clarity or another like phrase. 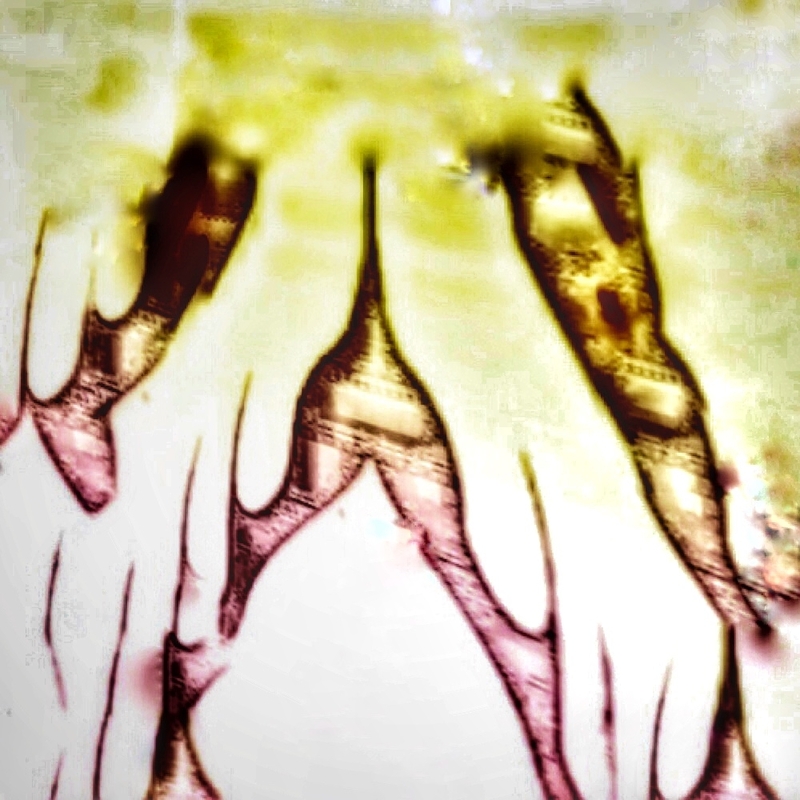 When we look in oil and water, especially black oil, its not only dense but we can't see to the bottom until we discriminate body (oil) from mind (water). I would say they (mind and form) interpenetrate. Not one without the other. Not contradicting the oil and water idea though. They are distinct from each there but they interpenetrate. We are a psychophysical being. Mind-body if you will. Until We Come to No realm of Consciousness." Should I put in something more? Buddhism is just like an educational system so why not paint our way to understanding? Diagram it. That's a great idea. It looks good as is. When I was studying to be a Shiatsu practitioner, we had to learn about the 5 (Chinese) Elements: Fire, Earth, Metal, Water and Wood. Each Element - or 'Transformation' as I called them (something that. to my quiet surprise, our TCM Tutor adopted!) - has a Yin and a Yang side. They are characteristic of a Yin bodily organ, and its Yang bodily-organ counterpart. 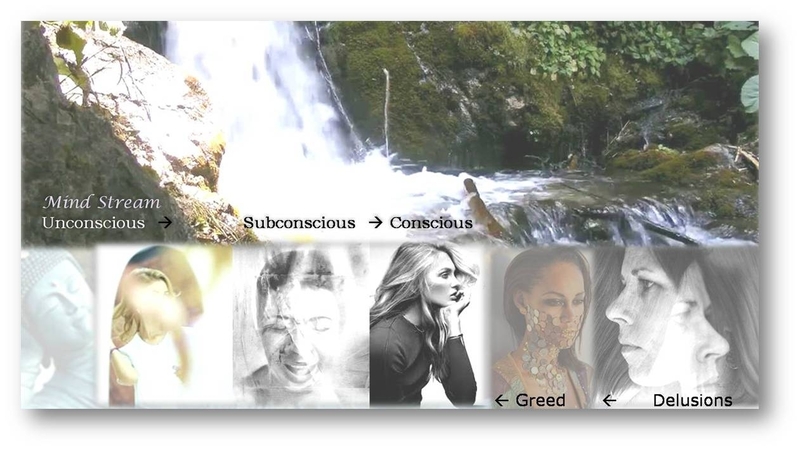 Each Transformation has several significances, functions, aspects, characteristics. It could have become complicated. I made it easier to memorise each Transformation's complete profile, through drawing and colour. Each Transformation, committed to drawing, is still as fresh in my Mind's eye, as if I had done them yesterday. I'm afraid there's still some work to be done ... but you can probably get there. One fundamental argument for the Buddhist concept of a not-self is the notion that if there were such a thing as a self (as a persistent entity), then it would undoubtedly be composed of other things. And the Buddhist philosophers through the years have determined that if there were a persistent self, it would be composed of the five skandhas - nothing more, nothing less. But the traditional argument is that these skandhas aren't permanent - they have no inherent existence - and they essentially come and go, moment by moment. (The Heart Sutra from the @lobster post above addresses this and Nagarjuna is also a great resource here, but admittedly a little much.) If the skandhas consistently come and go, then this thing called a self must come and go ... and so there is no such thing as a persistent self. 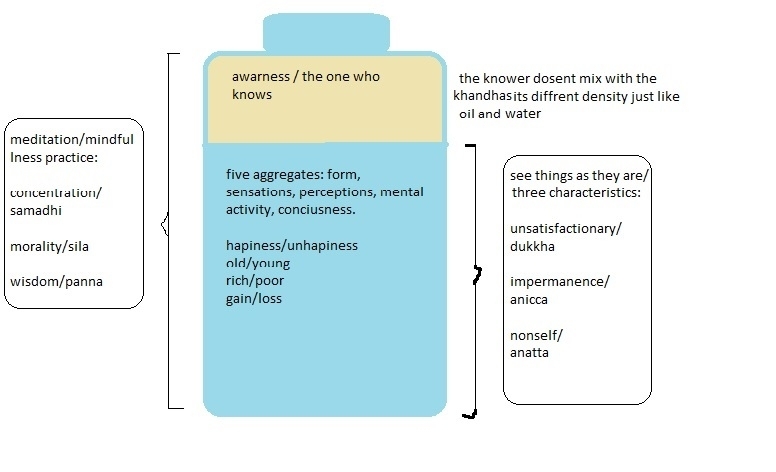 Unfortunately, the bottle model seems to show that the skandhas have some kind of existence and therefore seems to make the argument for a self, composed of this oil and water. A great first crack at it, I'd recommend another go. Buddhism is just like an educational system so why not paint our way to understanding?